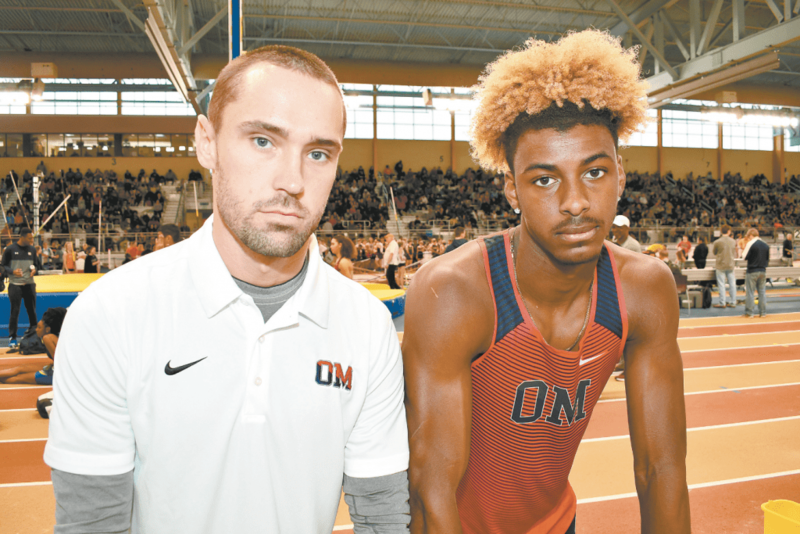 Oak Mountain High School track coach Riley White, left, with senior Trey Allen at the MLK Classic held at the CrossPlex on Martin Luther King Jr. Day. Allen recently set a new high jump record at the Ice Breaker Meet. Journal photo by Jordan Wald. Oak Mountain High School track coach Riley White, left, with senior Trey Allen at the MLK Classic held at the CrossPlex on Martin Luther King Jr. Day. Allen recently set a new high jump record at the Ice Breaker Meet. Oak Mountain senior Trey Allen set an indoor AHSAA state record for the high jump, clearing 6 feet, 11 inches at the Ice Breaker Meet held at Birmingham CrossPlex. Allen’s leap earned him the AHSAA Indoor Track Spotlight this week as well as raising the bar for other jumpers who want their names in the record books, according to an announcement from the AHSAA. The old state record was 6 feet, 10¼ inches. The national prep record of 7 feet, 5.3 inches is held by Scott Sellars, who set the mark in 2004 while competing for Cinco Ranch High School in Texas. Allen earned All-America honors at the New Balance Nationals in North Carolina last June and set a Class 7A state record along with Baker’s Dontavious Hill in the Class 7A outdoor state championships in May. Both high jumpers hit the 6-foot, 10-inch mark in that meet. Allen edged out Park Crossing hurdler Jasmine Riley and Oak Mountain sprinter Nicole Payne for this week’s AHSAA Indoor Track Spotlight. Both girls have shined this indoor season. Payne was to be among top high school track stars in the state trying to set new records during the 2019 MLK Classic held at the CrossPlex on Martin Luther King Jr. Day. Results of the MLK Classic were not available at press time. Two other Over the Mountain track athletes marked season highs during the Icebreaker Classic, held Jan. 5 at the CrossPlex. Makiyah Sills, a senior sprinter at Homewood, turned in the best 60-meter hurdles time of the season at the meet, with a winning time of 8.77 in the 6A/7A competition to set a new girls’ record for the meet. Will Stone of Homewood set an Icebreaker Classic indoor record for the 1,600 meters with a 4:19.04 time in the 6A/7A division, best in the state this indoor season. Stone also has the best time in the 3,200 meters this season, 9:22.99, which he ran in the Magic City Invitational on Dec. 1.